It has been over a week since the wood firing and I'm still finding articles of clothing that smell like a raging campfire. Scarlet lingers on my Kevlar sleeves, my jacket and my boots. It's only been a week and I already miss the feeling of a face full of white flames. 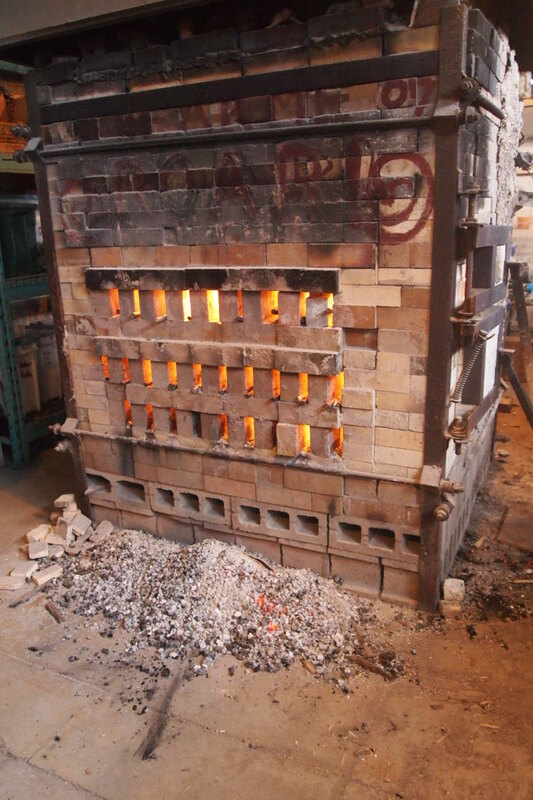 We arrived to load and prep the kiln on Monday morning at 9:00 and were expecting to finish and start the fire by 1:00 pm. What rookies we were! Four hours of prep and load time was a little too hopeful, especially for the relatively inexperienced. Before we started loading we still had to vacuum out the ash from the previous firing, chip off old wadding from the bag wall and floor, replace the grates in the firebox and make door slop. Loading took longer than expected as well, even though I've become accustomed to the lengthy wood, salt and soda loads. Surprisingly, adding little balls of refractory between each shelf and post takes up much more time than one would think. We finally started the fire at 4:30 pm and were off to an already tired start. Usually, the whole studio collaborates, every person gets to put in a half dozen pieces of work and the workload of pre-firing chores and stoking shifts are shared between the participants. 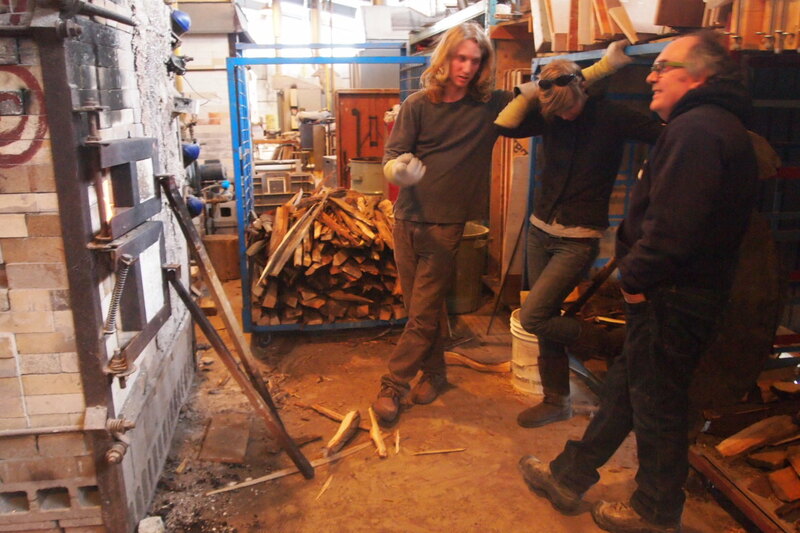 But at my critique in the winter, the response to my 3 wood fired works was You need to spear head a wood firing, and get more in that kiln - this firing was the response to their advice. There were three of us manning Scarlet on this particular venture - myself, Andrea and Annemarie (also third years using atmospheric firing for their work). 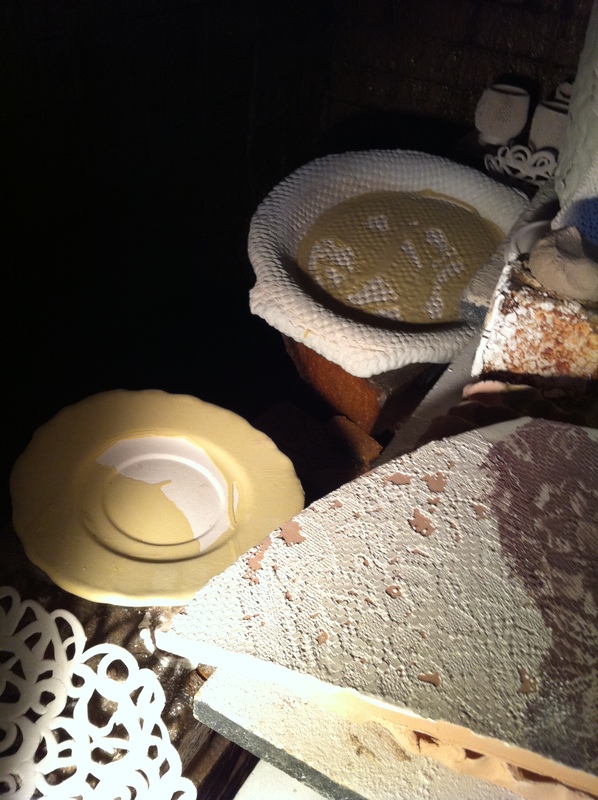 This time, rather than a half dozen pieces, I had 50 works in Scarlet's belly, taking up over a third of the kiln. My two fellow 3rd years also had a significant amount of work in this firing. Between the three of us, we took up the majority of the space. In exchange for the extra space in our kiln, some of the eager first and second years came by throughout the night with coffee, porridge, and snacks. They too, could not resist the smell of wood ash and billowing smoke. By lunchtime the next day, she was roaring. There is something remarkable about a fire that is hungry for more wood. At peak temperature, each stoke received a rumbling reply. Flames shot out of every possible opening and black smoke billowed out through the chimney. As the flames sucked back in, the smoke stopped streaming and the rumbling died down, we knew it was time to feed her again. 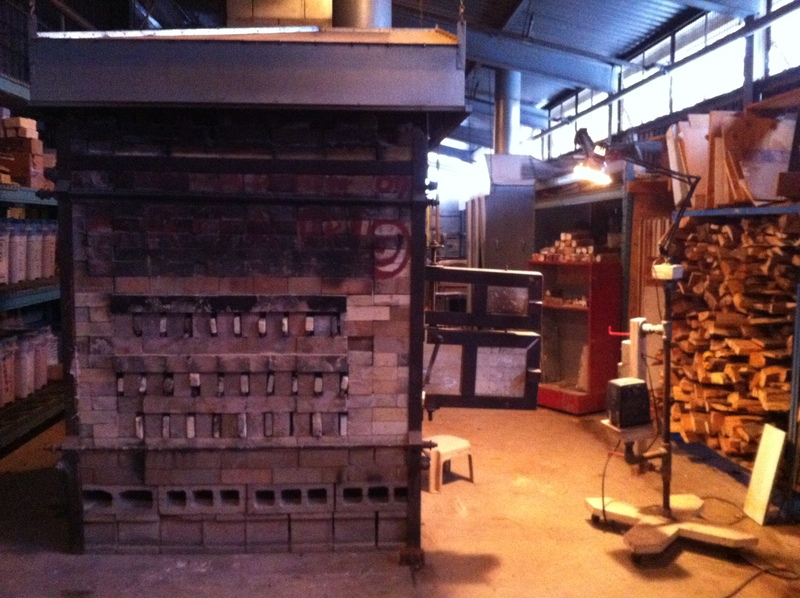 Firing a wood kiln is like feeding a beast, one that cannot always be tamed. She needs coaxing, and she often stalls just a few cones before reaching temperature - her way of telling you she's boss. At 23 hours our back cones were down and we were just waiting on the front to catch up. Though I had been up for 32 hours standing next to a hungry beast, the last hour was the home stretch - I felt surprisingly unfatigued. Rather, on the last stoke I felt victorious. There were points during the firing where I thought - This can't be worth it. Next time, I'm not staying up all night. I'll hire help. But after a cold glass of beer, a good night's rest, and unloading gifts from Scarlet's belly - I have to say it was all worth it. I'm a kiln rat and a pyromaniac, I'll never be steered away. Here are some photos that Andrea took during the firing.